Magnetic Modulator – The most reliable substitutes for electromechanical choppers are magnetic modulators. These devices reach a null stability as low as 10 μV, but their response time is often less than 2 Hz and the ambient temperature range is restricted. The 3-leg saturable reactor, shown in Fig. 14.32 falls within the cat­egory of magnetic modulator devices. 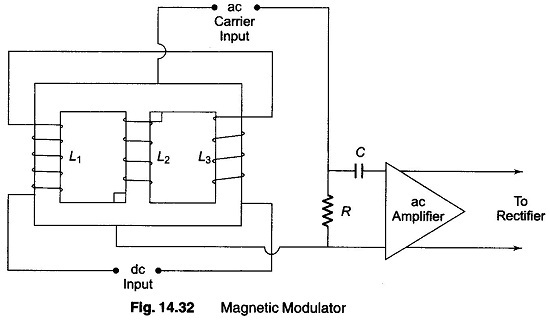 A magnetic modulator is based on the principle of saturation. If dc product is applied to windings L1 and L2, the core will be saturated according to the B—H loop characteristics. As shown in Fig. 14.32, L2 is the ac excitation winding and L1 — L3 are the dc winding. A given degree of magnetic saturation causes a change of inductance in L2. If no dc voltage is applied to the reactor, the impedance of L2 will set the value of a given ac current flowing through it. Now if dc voltage is applied, it causes an increase in the core saturation changing the L2 impedance characteristics which in turn causing a change in ac current seen by the follow-up ac amplifier. The dc excitation windings are connected in Buck type configurations. This configuration prevents the ac current to enter the dc windings by transformer action.